The only self sharpening saw teeth. The new super aggressive X Series are 2 1⁄2” carbide Gator Teeth that cut faster and last longer. The patented design of the front cutting tips make the X Series the only self sharpening saw teeth in the world. Plus they are built out at the corners giving you more carbide where you need it. This new shape changes the flow of sand and chips to keep the outer corners sharper and cutting faster. The new carbide shape also makes the discs last longer by keeping the flow of sand and chips away from the center of the tooth. This spreads the wear over a larger area of the tooth holder extending the life of the disc. 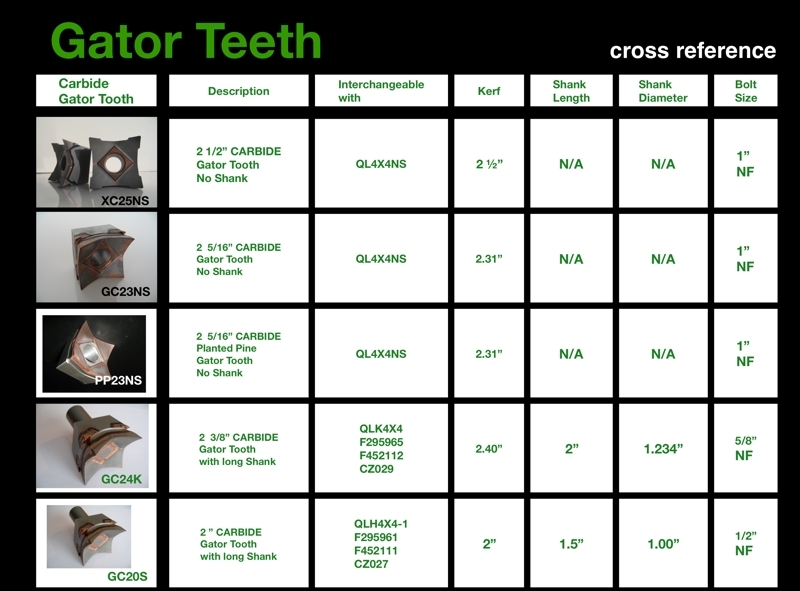 The XC25NS is interchangeable with the GC23NS Gator Teeth and fits on all Tigercat discs. The XC24K fits on all John Deere machines. Now available in 2 styles – with and without shank.